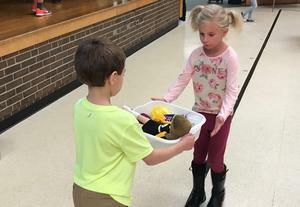 Metzgar Elementary's School Wide Positive Behavior Support Program, known as PRIDE, recognizes students for exhibiting the qualities of a Greensburg Salem Golden Lion. First grader Lily, a student in Mrs. Englert's class, used the behavior bucks she earned to enter a basket raffle and won a great prize! Being kind, respectful, and including everyone are a few ways to show your Lion PRIDE. We hope to catch and reward more students showing their PRIDE!